One report projects hospital construction will follow its upward trajectory over the next two years, hitting $8 billion in annual spending for new construction and $9 billion in renovation costs. What’s the main reason for this steady growth? “Healthcare facilities must continuously upgrade their equipment in order to stay competitive,” according to Health Facilities Management. 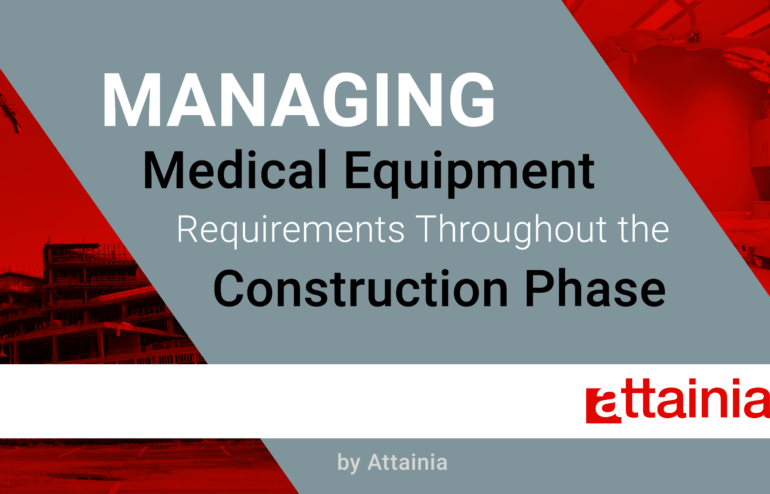 Medical equipment is an integral part of every construction project. Efficient equipment planning is a balancing act. Healthcare organizations need cutting-edge technology to remain competitive, but investing in every new trend is simply not practical. Successful equipment planning is finding the perfect balance between meeting patient needs with available technology, future proofing the facility, mitigating risk and acknowledging the realities of your budget. To gain that balance, successful project planning involves input from an entire team, including clinicians, architects and project managers. How can all these moving parts work together to make equipment planning seamless during the construction process? The answer is a combination of an equipment planning team and an efficient software tracking tool. Think of your equipment planning team as a primary source of data, including medical equipment history, current trends and helpful technological information and requirements. The data this team will gather is critical to obtaining unbiased recommendations and bids. Don’t wait to get this team involved. Including them from the start ensures that the business and clinical aspects of all affected services are considered. Equipment planning teams can actually streamline the decision-making and construction process. Having all the important data up-front prevents construction teams from having to modify plans down the road. Involving this critical team helps keep the project on schedule. Here’s a breakdown of equipment management throughout the construction process. Before the land is cleared, your architects must draw from the data provided by equipment planners. Functional planning includes how much space will be needed to accommodate the new equipment and its required technology. Industry standards verses organizational preferences should be discussed. These preliminary discussions should result in an initial cost estimate. This stage takes the data from the schematic design phase and gives it more detail. Preliminary equipment requirements turn into major equipment requirements. To organize these requirements, an equipment database is maintained that includes a room-by-room equipment listing as well as a Bill of Quantities (BOQ). The BOQ itemizes all materials, parts and labor associated with each piece of equipment. Basis of Design (BOD) principles are used to document the reasons certain decisions were made during the last phase. BOD documents will follow the construction process, continually being updated as new needs are identified. Pre-installation rough-in details are included in the documentation. Detailed drawings are produced and cost estimates are refined. This is the phase where all the cards are on the table. Documentation must define elements such as: the scope of the medical equipment services team, project milestones, communication protocols and equipment data formats (What software will be used?). A medical equipment and systems responsibility matrix should be developed to track all responsibilities and deadlines. Lastly, architectural plans are completed during this phase. Detailed documents must show equipment orientation in each room, access and routing, and special considerations like radiation or electromagnetic shielding, vibration or noise reduction, or specific exhaust considerations. It’s critical to get this phase right. Providing contractors with as much technical information as possible will ensure accurate budget forecasts and reduce the likelihood of having to rework plans later. Using an efficient equipment planning software system will help you accomplish this. Your medical equipment procurement team can handle the follow critical tasks when armed with the right data. Create a standard RFQ that includes all pertinent data for accurate quotes. Establish protocol for issuance, follow-up and documentation of your RFQ’s. Follow-up and review supplier bids for compliance and accuracy. Prepare comparison packages that include unbiased recommendations and comments for decision-makers. You’ll realize just how important the preliminary phases were during the construction and procurement phase. During this phase final decisions are made, suppliers are selected, purchase orders are issued, and on-site pre-installation and construction coordination begins. Consider these eight steps of procurement to better understand the depth of data analyzed and the amount of work put in by your procurement team. Final BOQ: A final BOQ is submitted for review by the Technical Committee and Clinical User Committee. Technical Specifications: Technical specifications are reviewed and three suppliers are recommended. Tender Packages: Tender packages are prepared and issued for the recommended three suppliers. Tender Package Evaluation: Tender packages are received and prepared for the technical and commercial evaluation committees. Technical Evaluation: Tender packages are evaluated for technical content and recommendation for successful supplier. Commercial Evaluation: Suppliers are called for final negotiation, terms and conditions, based on recommendations from the technical evaluation. Contract Initiations: Contracts are issued to the supplier. Technical Coordination: Supplier technical information, shop drawings and other key data is collected and coordinated with construction. If all preliminary work has been done, the installation and move-in phase should go smoothly. However, there is still work for your equipment team. Installation must be supervised, tested and commissioned. Training and documentation must be performed. Schematics and pre-construction drawings must be consulted to ensure all equipment is in its pre-planned place. To ensure a smooth process, medical organizations carefully select software to help them track all their data throughout the process. For example, using an effective software tool will allow you to view your procurement dashboard in real-time. Check the status of purchase orders, overall cashflow and how well you are sticking to the timeline. Healthcare equipment planning software allows the entire team to have online, live access to project data, including budget development, detailed room-by-room details, BOQ, item location reports, specifications and associated drawings, and electromechanical reports. Communication is the vital link between equipment planning and construction. Ensure that everyone has the most complete information. Learn more about how the software offered by Attainia can help mitigate and avoid costly problems during construction through effective planning and tracking.